As many of my readers will know, Bolt Action is a game that I love. 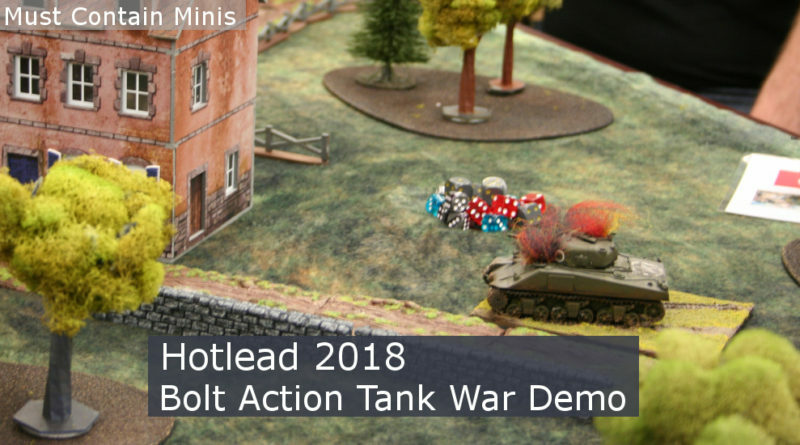 Recently, Dave Lamers and Randall Carder ran a few demo games of Bolt Action: Tank War for new players at Hotlead 2018. I am not exactly a new player, but I got in on one of their demo games and this is my report of that game. Because Dave and Randall ran this game as a demo game for new players, the guys simplified the rules down. The way that Dave looks at a Demo game is he wants his players to leave his table with a feel of how the game plays. He is not too worried about the players knowing the exact rules or whether the players would be able to run their own game immediately after they leave. 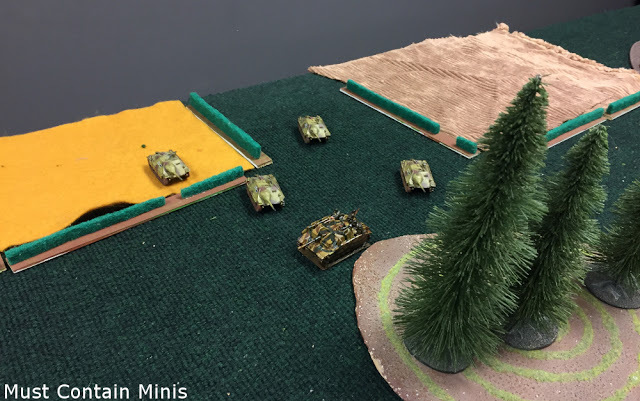 Instead, he provides players with an experience that teaches the basics of the game and then the players can decide whether Bolt Action is a game that they want to pursue further. To make things easier for his players, Dave created a number of player aids. 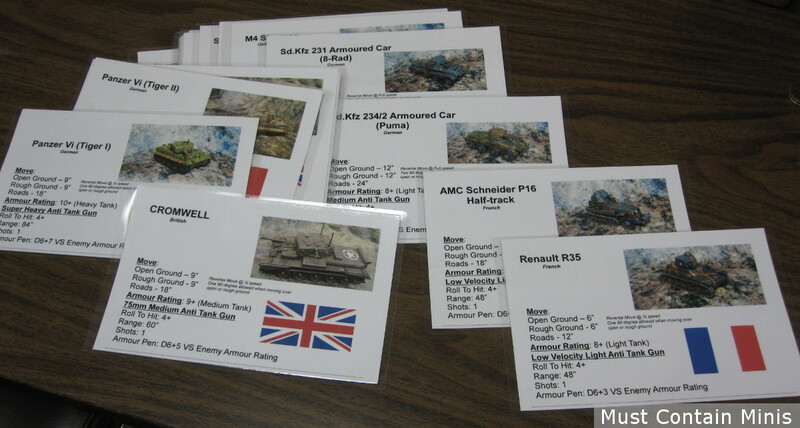 Each tank available in the game has its own card with its statistics. If you know the Bolt Action rules, you will notice that Dave modified the “Roll to Hit” value from 3 to 4. From that base number, the standard modifiers for movement, range and cover were also applied. Dave did away with the damage table for the demo. Any penetrating hit to an enemy tank would be good enough to destroy the vehicle. Above are the player aids that Dave and Randall prepared for their demo game. Notice how they made all of the information easy for players to quickly access. With the tanks easier to destroy, Dave and Randall decided to make this demo a “grinder” mission. 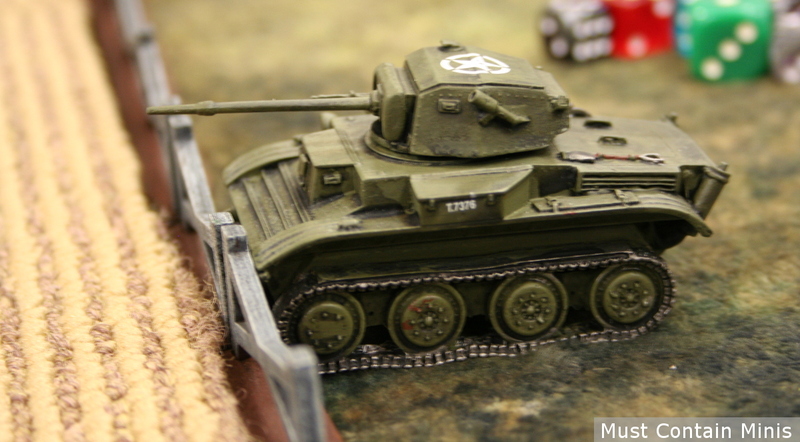 You start in a weak tank (I started in a Renault R35) and may take a slightly more powerful tank each time you come back to “life.” When a tank is destroyed, the tank is removed and a new tank enters the table on the player’s next turn. To determine turn order, the guys put everyone’s names on cards. The cards are shuffled each turn and when your name is drawn, you get to go. Dave and Randall set up the demo table as above. The table consists of a rural community. The owners vacated the houses in the middle, but left their cows behind. Many players at the demo asked Dave if the cows could be given special rules. “Not this time around, but perhaps in the future,” Dave responded. Dave allowed players to enter from whatever table edge they wish. On the far side of the table Dave and Randall set out the starting tanks for the event. This Report will not be too detailed. The game itself was light and quick as Dave and Randall only aimed to teach the basic rules of Bolt Action to those around the table. The Renault R-35 French Tank. Not a powerful tank by any means. I started the game with a small French Renault R-35 Tank. 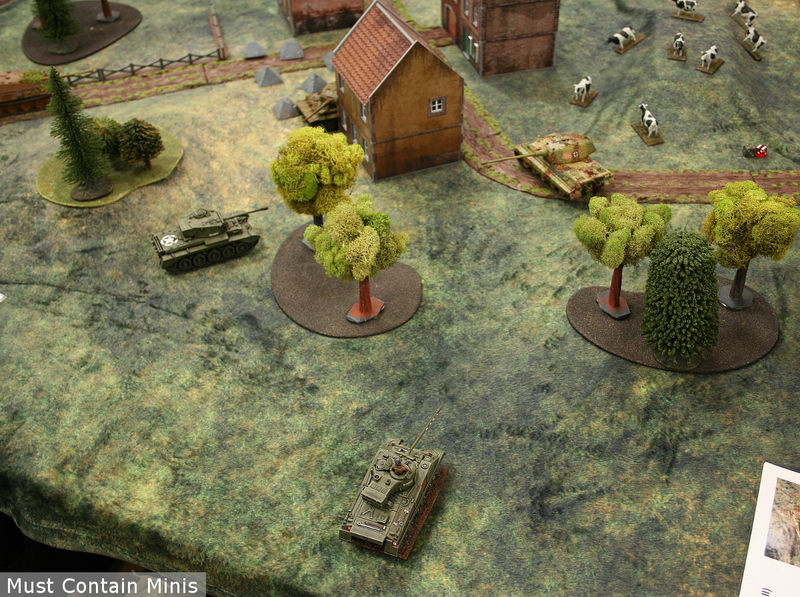 The first tanks enter the battle and maneuver for position. There is a Puma behind that tree on the left. 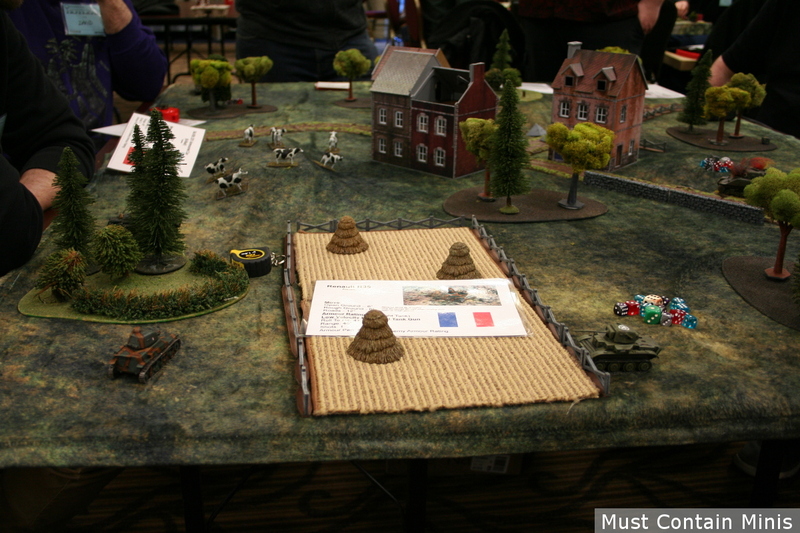 An American tank sees my little French tank and takes fire. Apparently Axis and Allies do not matter in this demo game. It is a free for all! My tank takes a side shot from a little American tank and explodes. This little Chaffee took out my R-35 right off the top of the game. Because another player destroyed my tank, I got to choose a new tank. 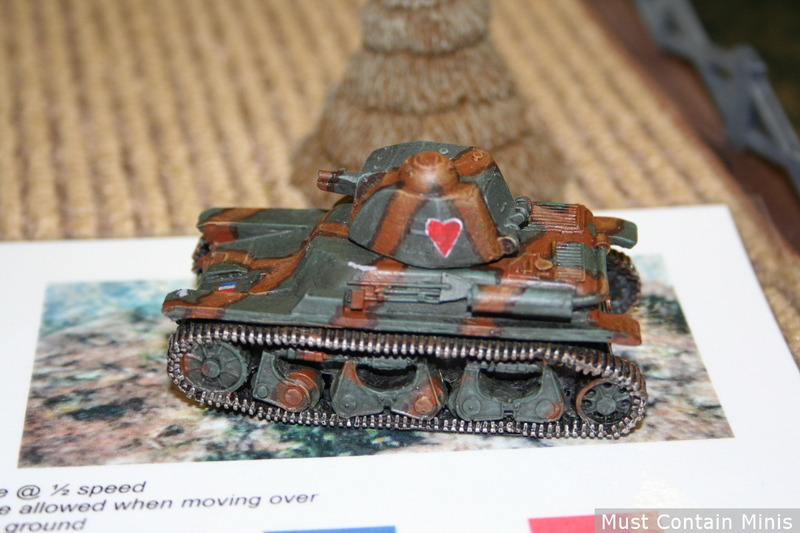 I chose one of my favourites – a common StuG. I chose a StuG as my replacement tank. Since ally-ship is of no consequence in this demo, every tank on the table is a target. The guys did a beautiful job painting this model. Looks great to me! I enjoyed running this assault gun and if there were an award for survival, I would have won it with this tank. I lasted multiple turns with this one and focused on long-range shots on other tanks. Unfortunately, I didn’t take out a single tank with this one. 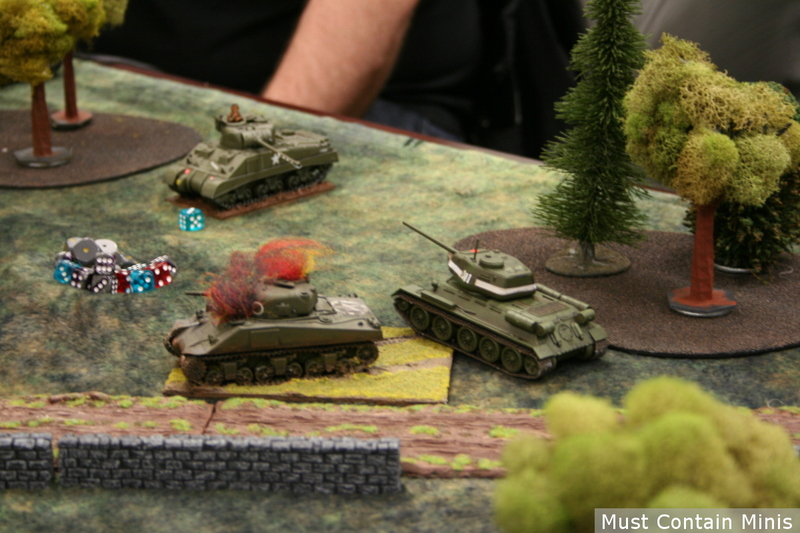 On the other side of the table, some big tanks went at it while I took pot shots at them from a distance. As these two tanks dueled it out, I took pot-shots at the Firefly, but could not harm the tank to start. Sadly, I don’t remember if it was me or another that ended up taking care of that Firefly. Three heavy cats prowl the board. At this time, I was still running the StuG and my new target was that Jagdpanther. After trading a few shots, the Jagpanther popped my StuG wide open. Unbelievably, the Axis forces at this time called a truce among themselves and focused on Ally tanks (aside from my StuG). For my next tank, I chose a Firefly. At this time, our Game Master declared that the game to goes into a “Sudden Death” scenario. This meant that from now on, we were not allowed to choose new tanks. If our tank dies, we are out of the game. The game went back into a Free-For-All State. This would be my last turn. I entered the battle field as a Firefly and took a shot at the King Tiger. I missed the tank and would suffer my demise at its hands. If I remember right, the British Comet took out the King Tiger after the King Tiger took out me. 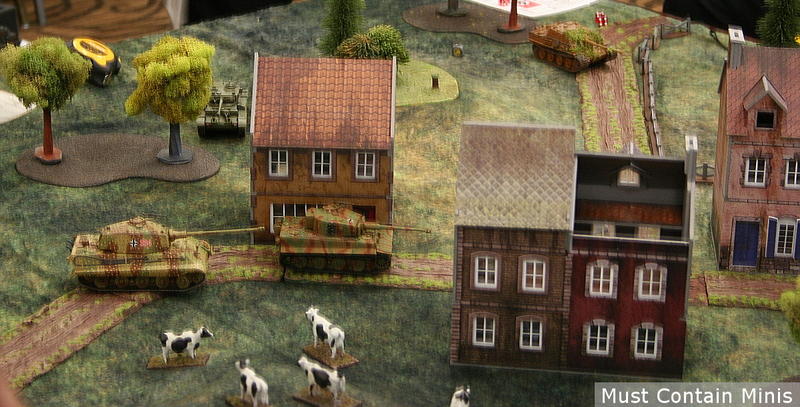 The Comet survived this round and the Tiger got taken out by a Jagdpanther. The game continued on until just one player remained. I think it was the Jadgpanther that won, but don’t 100% recall. 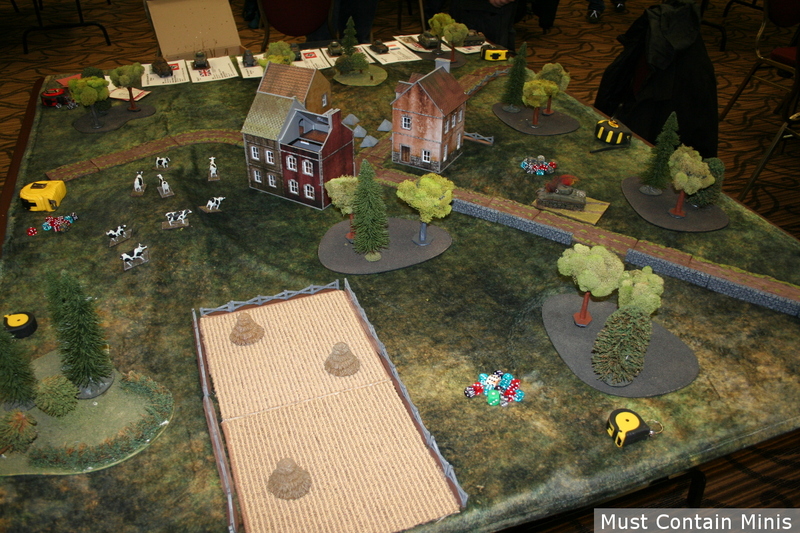 Running a Bolt Action Demo this way is an interesting way to introduce people to the game of Bolt Action. For me, it seems inspired by the way the local guys introduce players to BattleTech as the local BattleTech guys often run “Grinder Games” at my area conventions. In fact, it was one of those Grinder games that encouraged me to buy my Starter Box for BattleTech. 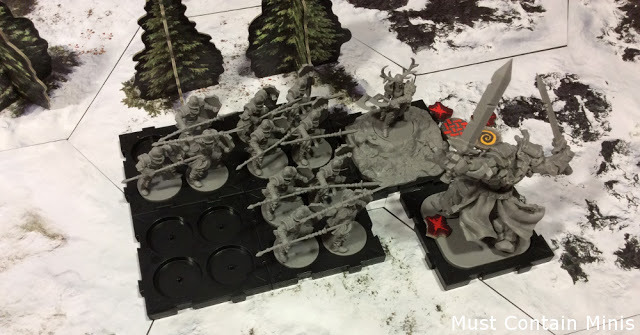 Whether the same approach will encourage players to buy into Bolt Action remains to be seen, but it is certainly an interesting approach. Personally, I like a little more complexity than what was in this demo, but the demonstration game certainly achieved Dave and Randall’s Goals. 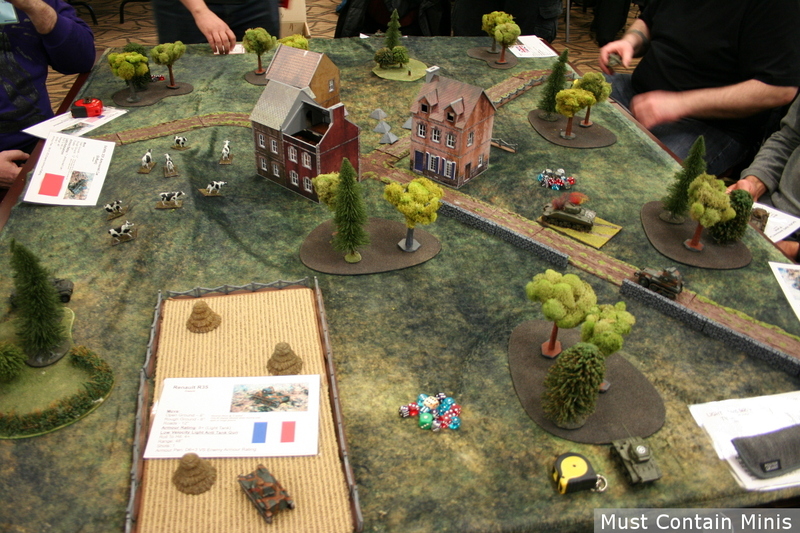 It introduced players to the concepts of random turn orders, movement and combat in Bolt Action. It was not overwhelming by any means and people seemed to enjoy the game. Thanks guys for hosting a fun game of Bolt Action: Tank Wars.